Domestic Moose: Postage Stamp Quilt along - top DONE! So, it's been awhile since I updated. I just haven't been quilting or taking pictures like I should be. 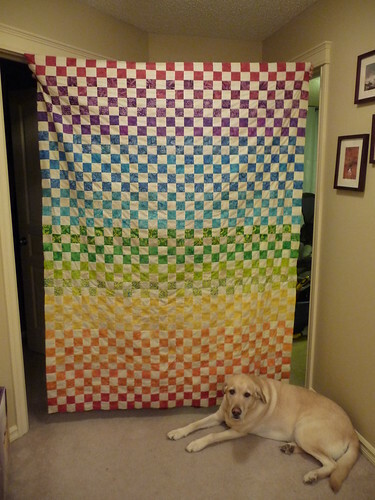 I finally got Mr. Moose to hold up the postage stamp quilt from the quilt along so I could get a good picture. I'm pretty happy with this AND it's got a home. My Mother in Law (MIL) seemed very interested when I described it to her. Unless I decide to keep it myself because it looks awfully great on my red furniture. I'm not sure why the photo is blurred, but there you have it. I did have to trim up the blocks when I was done thanks to uneven strips. 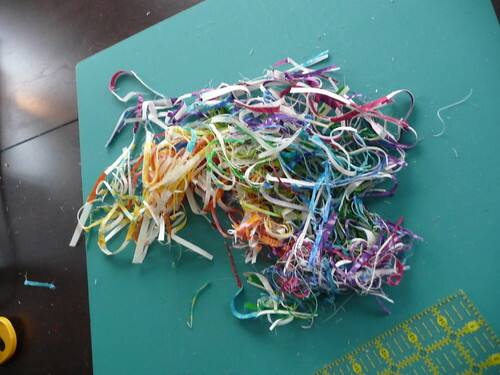 Here's a shot of the trimmings. 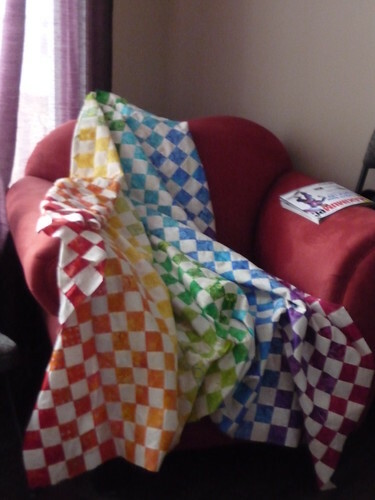 I just love how bright and colourful this quilt ended up being.